Three-time winner Tiger Woods has entered the Open Championship at Royal Troon even though he was unable a week ago to set a date for his comeback. Confirmation that Woods had registered for the Claret Jug event was delivered by the R&A on the day entries closed. It follows Woods, who has been sidelined since last August after undergoing his second and third back procedures, also having entered the season’s second major, next month’s US Open at Oakmont. Woods tied for ninth in the last Open Championship at Royal Troon in 2004, when compatriot Todd Hamilton sprang a surprise by claiming the title after beating Ernie Els in a play-off. 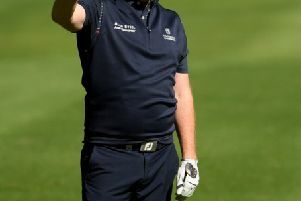 The following year Woods recorded the second of his wins in the event at St Andrews, having also triumphed at the same venue five years earlier before claiming a third triumph at Royal Liverpool in 2006. He missed the cut in last year’s event at St Andrews for only the second time in 19 appearances. His last appearance was in the Wyndham Championship nine months ago and Woods seems no closer to being able to put an exact date on his return. It was at that event at Congressional Country Club that the 14-time major winner hit three balls into the water as he looked stiff and rusty. Doubt has since been cast on Woods’ future by David Feherty, the NBC Sports and Golf Channel commentator. “I am not sure that Tiger will come back because it is a nerve in his back,” Feherty told Irish Golf Desk. “It’s not muscular or skeletal. It’s not something you can deal with in a physical way. “He is in phenomenal shape - just ripped as usual. But he is not able to make a full pass at it.